Surfing in Colombia is considered by many as the last frontier of surfing in Latin American as this stretch of coast has long flown under the surfing radar, due in part to a combination of isolation and the long shadow of a violent past. As recent as fifteen years ago, the beautiful Colombian coast line was a no-go zone overrun with left-wing guerrilla groups, paramilitaries, and drug traffickers battling for control of the region. However, the political situation has long been stabilised, and word has spread of the amazing set-ups hidden here. Now is the time to surf Colombia’s perfect waves. What’s the surf like in Colombia? Colombia is a beautiful, sensuous country that is deeply immersed in nature, music, dance, lush green jungles, sophisticated towns and cities and fantastic surf spots for all level of abilities. There are two different coastlines to explore when surfing in Colombia, the Pacific and Caribbean. The Pacific and it’s many un-surfed spots, is best from April to October and has some amazing surfing beaches on its Western Pacific Coast. Some of them are easier to get to than others but any surfer willing to progress will be happy to know that there is opportunity for many different types of Colombia surf experiences, depending on skill levels and preferences such as left or right walled waves, point breaks or beaches or whether you simply want to surf alone. November to March, is when the more developed and easier-going Caribbean coastline comes to life and during these months, will barely drop below waist-height, making for some great beginner and intermediate waves if you are considering a Colombia surf camp.The waves that hit this stretch of the Caribbean are all locally produced wind swells that have a very short wave period, which can result in messy surf, don’t worry though you can still get great waves during this time on your Colombia surf trip. It just means catching the glassy morning conditions and late afternoon session when the winds back down. The hurricane season between August and November can produce a solid clean groundswell for Caribbean Colombia which can result in top to bottom barrels that are best surfed by intermediate and advanced surfers.The dominant swell size is between the 3-6ft, but it can get to double this with the swell often building through the day and then dropping off slightly as the wind dies overnight. Tidal variation rarely exceeds 0.3m. The best time for surfing in Colombia is December through March and July through September. Colombia’s biggest international airport is Bogatá’s Aeropuerto Internacional El Dorado. Direct services from Europe to Bogotá are offered by Iberia (Madrid and Barcelona), Air France/KLM (Paris), Avianca (Barcelona and Paris) and Lufthansa (Frankfurt). Avianca also operates flights from Madrid to Cali and Medellín. Whilst lacking the power and size of its Pacific counterpart, the surfing beaches on the Caribbean coast are much easier to get to, are more tourist oriented, and tend to be a bit calmer and better for those seeking the best beginner and intermediate surf beaches Colombia offers. Surfing beaches along the Caribbean are usually closer to the main city centres and there is road access, walking access, and more bars, restaurants, surf shops and accommodation. Barranquilla is a port city laid out in a tangled ribbon along mangroves and the Caribbean Sea. It prides itself for being the birthplace of Colombian pop songstress Shakira and for its annual carnival. Once a year the whole town clocks off, puts on its finest attire and lets loose at the country's biggest street party. This Mardi Gras celebration is second in size only to that in Rio de Janeiro, making it South America's second most important carnival. It's held in February on the four days before Ash Wednesday, there are street bands, masquerade and fancy dress, live performances, and a riotous, slightly unhinged atmosphere as the town drinks, eats and dances itself into the ground. 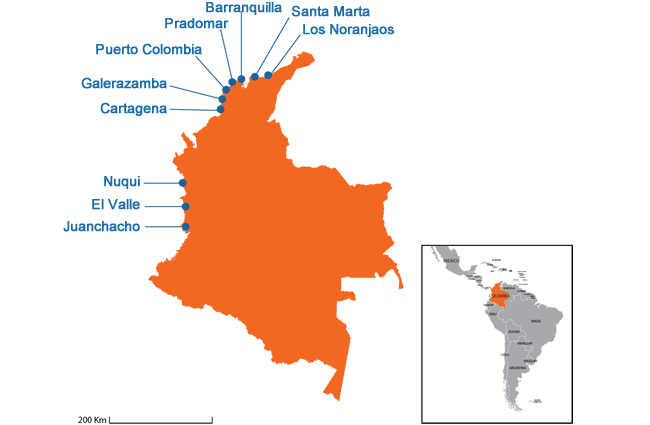 If you can time your Colombia surf trip within these dates, we highly advise it! Predomar is a very popular Colombia surf beach, so expect to share a wave during the weekend mornings or for a session to yourself try and go during the week or for the dawny session. The wave itself offers both left and rights and there are some fun bars, restaurants and shacks along the beach that offer fresh fruit, delicious food and cold beverages. Puerto Colombia packs a bit more power in its waves and offers up a good option for intermediate surfers on one of our Colombia surf camps as it has a fewer people in the water and the punchy walls offer the perfect canvas to get your turns dialled in.Once you are in the area ask for El Muelle and everyone will know what you are talking about and point you off in the direction of uncrowded waves, deserted stretches of sand and breath-taking scenery! A great wave for those willing to push themselves and progress to the next level is Punta Roca, this easy-to-find beach has arguably packs the most power among the waves in the Caribbean side, which keep the crowds to a scattered handful. A-frame peaks offer left and right speed walls for those who can make the drop, you may just get the barrel of your life! Cartagena de Indias is the undisputed queen of the Caribbean coast, a city of romance, legends and superbly preserved beauty lying within an impressive 13km of centuries-old colonial stone walls. Cartagena's old town is a Unesco World Heritage site, which is a maze of cobbled alleys, balconies covered in bougainvillea, and massive churches that make for a sightseeing dream! Cartagena is perhaps the clearest example of the emerging hospitality and surf industry boom in Colombia. There is an abundance of hotels, restaurants and transport options, and the main surf spot, Cartagena Jetty, towards the western side of the main beach is very calm break, with lulls between set waves, is ideally suited for beginners and the perfect locale for those wanting a laidback Colombia surf experience. Hilton, unsurprisingly got its name from the massive hotel that overlooks the spot, and offers up one of the more fun and unique Colombia surf spots. A series of jetties separate the beach and swell wraps around into the bay creating fun, hollow right handers that can link up when a big swell is running and due to the direction of the peninsula is often offshore. The next surf area near Cartagena, located roughly 40 minutes’ drive away, where the waves are a little larger, but are still suitable for all ability levels. We suggest that if this is your first experience surfing, you should head here halfway through your Colombia surf holiday so you can progress to the next level. Far off the Caribbean coast, and 750km from Colombia mainland, you’ll find the island of San Andres, famous for its unrivalled natural beauty, world class diving spots and fishing, yet many are surprised to learn of the fantastic waves that break here when the swell direction and winds line up. Punta Sur on the southern end of the island is the best place to head for an alternative Colombia surfing holiday. This empty expanse of beach is great for all surfing levels as you can find all varieties of peaks from fast breaking barrels to gently breaking outside walls for beginners and intermediates. Once on the island it's easy to reach by car or on foot and once their you will have hours of consistent waves where you will more than likely run into some interesting and curious locals! Surfing here is best between November-February and June-September when the waves are slightly larger. Outside of these periods, the swell is poor because of the offshore corral formations around the island. The Pacific Coast of Colombia is often heralded as the last frontier of the Latin America surf scene, where there are an untold amount of surf spots waiting to be discovered, which has already started to happen! Many consider this side of Colombia to be home to the finest waves in South America, which were backed up by a fellow surfer who made us green with envy after showing photos of a deserted beach with Mexican Pipeline shaped peaks breaking up and down the bay with not a single person in sight. Apparently, he surfed here all alone for six weeks straight, we cant promise that this is the norm for a Colombia surf holiday though! Travelling here is a bit difficult, so a Colombian surf trip here would appeal to the more adventurous surfer and as result of the remoteness of the more popular surfing beaches, accommodation can also be a bit sparse. If you are a tourist, it is important to have a guide or travel with someone who knows the area, which will be provided by the surf guides and instructors on your Colombia surfing escape. Most of the surfing beaches can only be accessed by boat or plane and you must understand that you are wandering off the beaten path for this type of Colombia surf experience. Untouched paradise awaits, along with roaring waves and phenomenal scenery. The centre of Colombia surfing on the Pacific side is a beautiful little town called Nuquí, and is best reached by boat from Buenaventura or by plane from Medellin.This go-to area for surfers in Colombia has experienced a mini boom in the last few years as new beaches have been discovered, infrastructure has been greatly improved and there are numerous accommodation options, from eco-lodges, hotels, b&b’s and camping. If you’re looking for a Colombia surf holiday with a difference, be sure to do so during the June to October window for the chance to experience a whale watching tour. This is the migratory time of year and the waters of the Pacific are teeming with pods of massive whales. The main break at Nuquí is a left hand river mouth wave that is perfect for beginners and long-boarders and is best surfed on a big SW swell. Only accessible by boat and appealing to intermediate surfers ready to take their surfing skill set to the next level as El Valle packs a bit more of a punch and can handle large swells. There is inexpensive accommodation available and the locals are extremely friendly with visiting surfers and tourists. Terco and Termales are just a short boat ride away and are a great spot for a first foray into the salt, and offer both left and right walls that offer the perfect canvas to master the basics. Further south is Juanchacko. It is home to some of the best waves that have been discovered on this stretch of Colombia yet remains relatively untouched. Take a boat from Buenaventura, walk to the beach and flash your biggest smile for the locals who will greet you fondly after a day sharing beach break walls among friends. The water is perfect for shorts, a rash vest and sunscreen all year as it only varies slightly between 26 °C and 28 °C making for perfect conditions on your Colombia surfing vacation. The weather is hot all year around in Colombia, with the average temperature varying between 25-34°C. Towards higher elevations such as the Sierra Nevada de Santa Marta, which are the world’s highest coastal mountains at 5775m the temperature can cool down to 12 - 22°C. The most comfortable season in terms of weather, extends from December to April, as it is the driest time of the year, and the evenings are freshened by a light breeze, making the heat more tolerable. From May to August, regular light showers make the hot climate heavier, and the temperature can reach an astonishing 45°C. The months of September, October and November are the least appealing. Torrential downpours can occur every day, flooding certain areas. October is considered the wettest month, where it receives about 235mm of rainfall. For a more detailed look at when & where to surf in Colombia for your surf level use our Surf Trip Finder. Then browse each destination to discover the best selection & lowest prices. We have a great choice of Colombia surf camps, self catering accommodation & surf lessons in Colombia's best surf towns. Book your surf holiday online now!